Giving away free downloads of the new "South Park: Tenorman's Revenge" Xbox Live game. 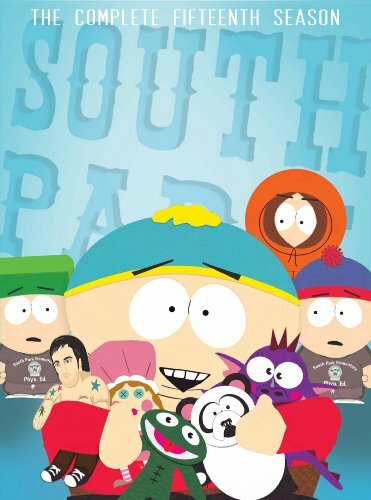 Each Blu-ray and DVD will include a unique code inside for fans to enter at http://www.southparkstudios.com/shop/dvds/season-15 to get thousands of prizes. It's first come, first serve so fans have to act fast. The first 5,000 to enter their code will get a download of "South Park: Tenorman's Revenge" game, an exclusive "South Park" theme and a 48 hour trial of Xbox Live Gold Membership. The next 70,000 entries will get an exclusive "South Park" Xbox theme and a 48 hour trial of Xbox Live Gold Membership. Micro-site for South Park Season 15 DVD and Blu-ray (out 3/27) has now gone live! Get your copy of South Park: The Complete Fifteenth Season Uncensored and you could recieve a code for a free copy of the game South Park: Tenorman's Revenge, an exclusive South Park theme for your Xbox or a 48 hour Xbox Live Gold Trial Membership. On Tuesday, March 27, South Park: The Complete Fifteenth Season Uncensored will be released on Blu-ray and DVD by COMEDY CENTRAL Home Entertainment and Paramount Home Media Distribution. In addition to all fourteen uncensored episodes from "South Park's" landmark 15th season, the Blu-ray and DVD include the groundbreaking documentary "6 Days to Air: the Making of South Park", a first-ever look behind-the-scenes at South Park Studios that gives fans an insider's look at the making of an episode. The bonus features are rounded out with "6 Days to Air: Behind the Scenes of 'City Sushi,'" mini-commentaries by creators Trey Parker and Matt Stone and never-before-seen deleted scenes. Each South Park: The Complete Fifteenth Season Uncensored Blu-ray and DVD come with an added bonus. We're giving away free downloads of the new "South Park: Tenorman's Revenge" Xbox Live game. Each Blu-ray and DVD will include a unique code inside for fans to enter at http://www.southparkstudios.com/shop/dvds/season-15 to get thousands of prizes. It's first come, first serve so fans have to act fast. The first 5,000 to enter their code will get a download of "South Park: Tenorman's Revenge" game, an exclusive "South Park" theme and a 48 hour trial of Xbox Live Gold Membership. The next 70,000 entries will get an exclusive "South Park" Xbox theme and a 48 hour trial of Xbox Live Gold Membership.